Protecting your device, be it a tablet, PC or tablet, against security problems will help a lot later on. Why? Well, a powerful security product keeps you safe from people who want to steal data from your gadget. If that data is very important to you, not having a well-protected device means losing everything you hold dear. McAfee, Inc. is an American company which first appeared in 1987. The group specializes in manufacturing security software for a number of devices. No matter if you’re an individual user or a business with many employees, you need something very efficient to protect all your products. 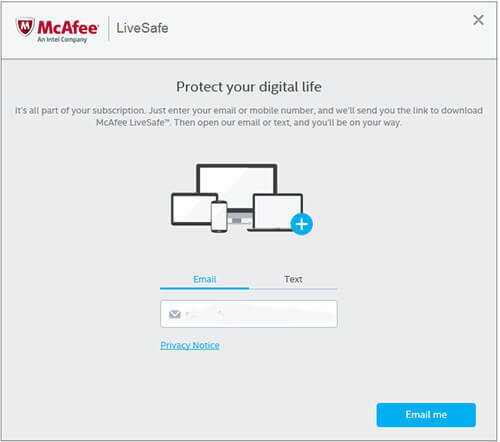 McAfee Antivirus Plus and LiveSafe are the kind of protection software that makes sure your smartphone, computer or tablet doesn’t experience security issues. 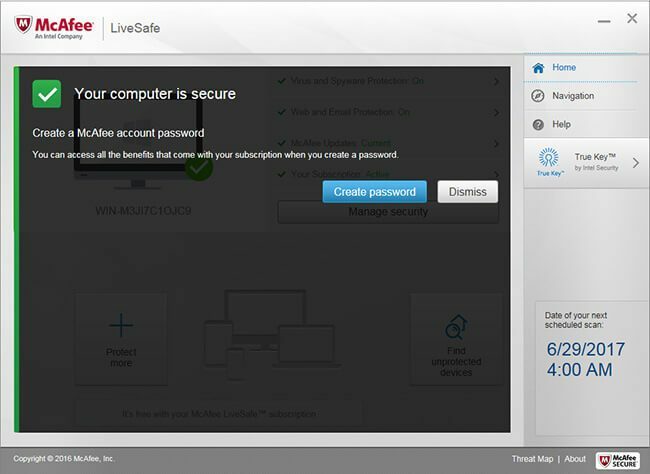 For today’s review we did a full analysis of both the Antivirus Plus 2019 and the LiveSafe, which is the premium security package offered by McAfee. 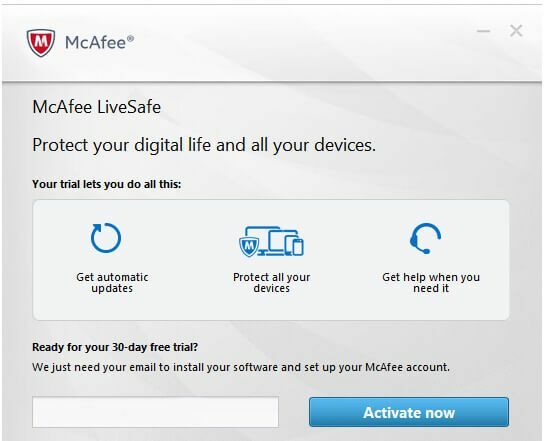 To enjoy the full benefits of the McAfee Antivirus Plus and LiveSafe 2019, the device you install it on needs particular requirements. If you want to have it on your smartphone or tablet, make sure the latter runs Google Android 4.1 or higher and iOS 9 or later. Computers with Windows versions 7, 8, 8.1 and 10 are all compatible with this antivirus. As are PCs running Mac OS X 10.10 (or later). Make sure your Internet connection for all your gadgets is high-speed. As usual, we installed both security solutions on multiple computers and virtual devices to see how the antivirus dealt both when it was installed and when it was used. Both McAfee products did a superb job no matter the operating system or hardware of the device installed on. The installation process doesn’t end very quickly, due to the fact that the majority of files inside the antivirus are downloaded during it. This also happens in the case of BitDefender and Norton Security, because the installation kit occupies little space and the rest of the files are downloaded when the installation process begins. 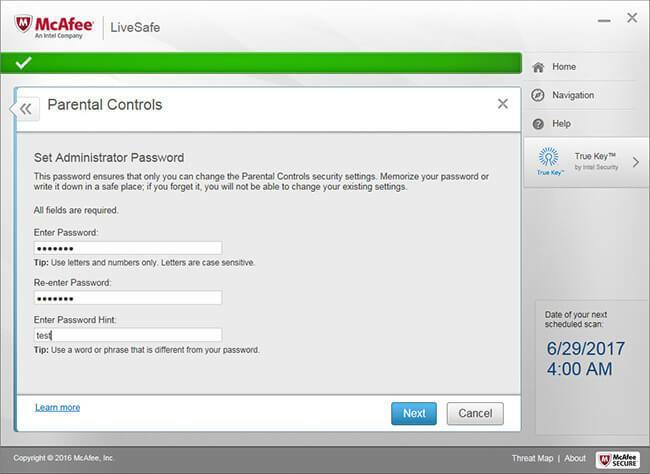 After the LiveSafe option is installed, it will need online activation. To do this, create a McAfee account for which you’ll require an email address and a password. The activation is over in a couple of seconds. You won’t need to confirm the email used for the registration. After the account is created, you’ll benefit from account management options, as well as management of all profiles associated with the account. Also, you’ll be able to manage licenses, access other McAfee product and you’ll have the possibility to contact the support team. We recommend activating this option. If you do, it will help you manage a number of devices available in the LiveSafe account. You can access the account online. The details concerning the activity of the security products already installed will be reported to the McAfee cloud. We will continue our review with a detailed analysis of both security solutions and what they can do. 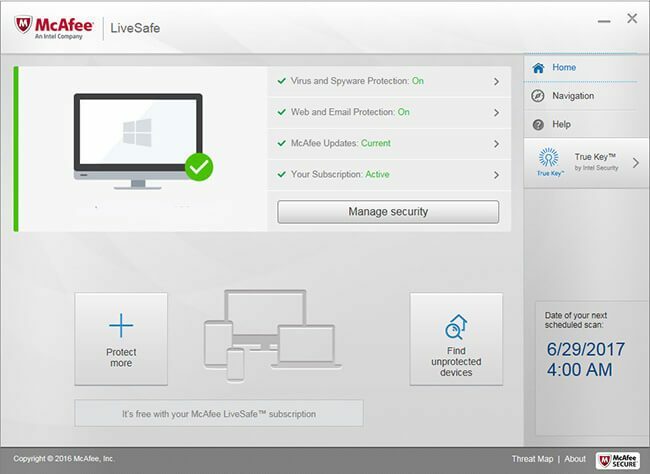 Whereas LiveSafe 2019 is a complete security suite, the McAfee Antivirus Plus comes with some of its features. Our review will have notes showing which features are available only with the LiveSafe version. Web protection (known as Siteadvisor or Webadvisor) that can detect phishing sites or malware-infected websites. Available in the case of both security solutions reviewed here, the Antivirus module comes with antivirus, antimalware and anti-ransomware features. It’s easy to use and efficient. The interface chosen by McAfee is kind of outdated compared to what competitors offer. This does in no way affect the very good performance of the module. 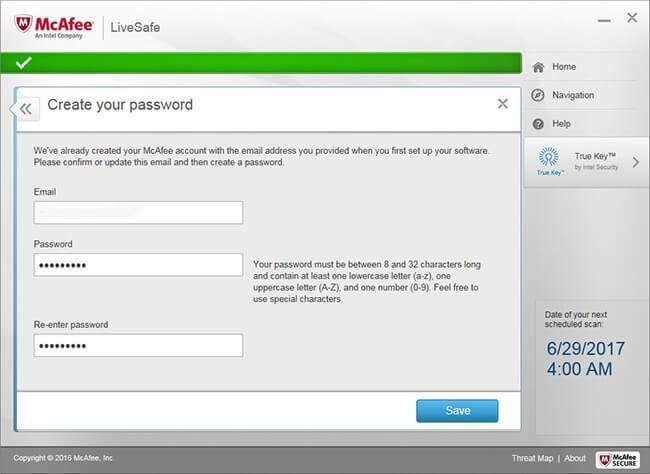 We tested the module both for the LiveSafe and the McAfee Antivirus Plus 2019. Results were identical or almost identical. The first test we did was to determine the way the antivirus deals with a sudden cyber threat. We created an EICAR test file and tried to save it. 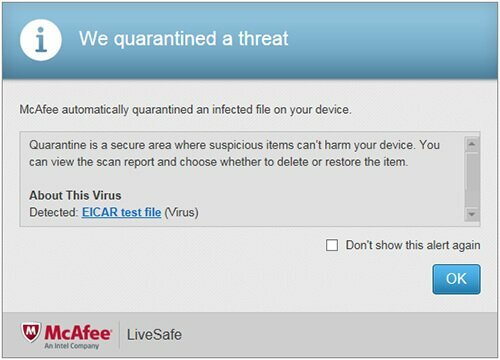 The antivirus module reacted immediately by blocking the file and automatically moving it to quarantine, where malware files can’t damage a computer. 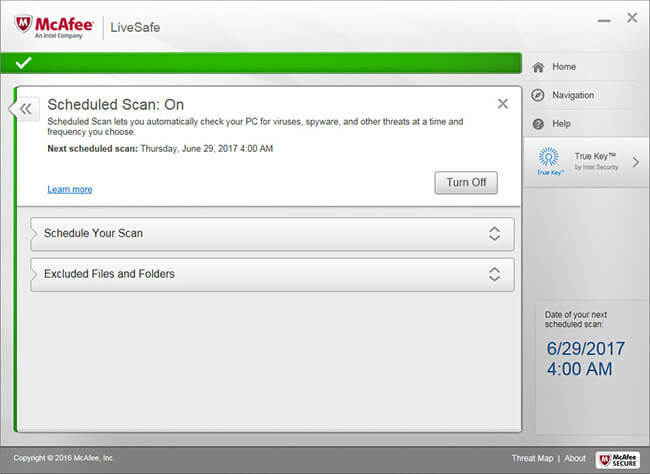 We also used the antivirus module to scan multiple files, complete partitions and infected files from a database. You can choose from quick, full or custom scanning. 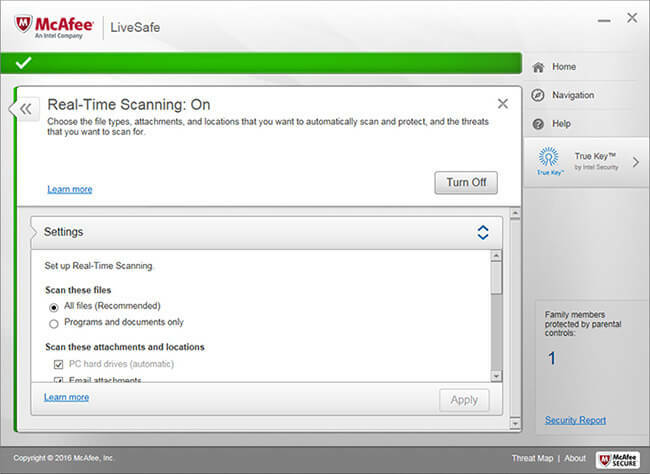 The McAfee Antivirus Plus 2019 also features the possibility to program a scan at a certain time of day or night. You can choose an interval when you know you won’t be using your computer. The scanning will be performed during those hours. 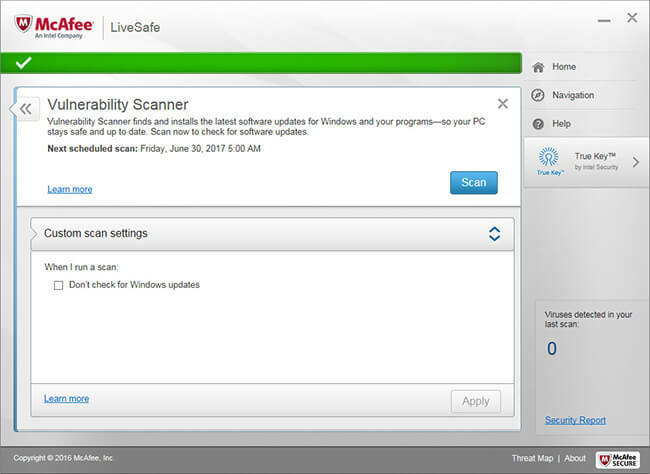 The antivirus has scheduled scanning by default. If you want to turn it off, you need to go to Virus and Spyware protection > Scheduled scan > Turn off. We tested the real-time scanning in controlled environments represented by intentionally infected computers or devices with inactive files that could be potentially destructive during the running. 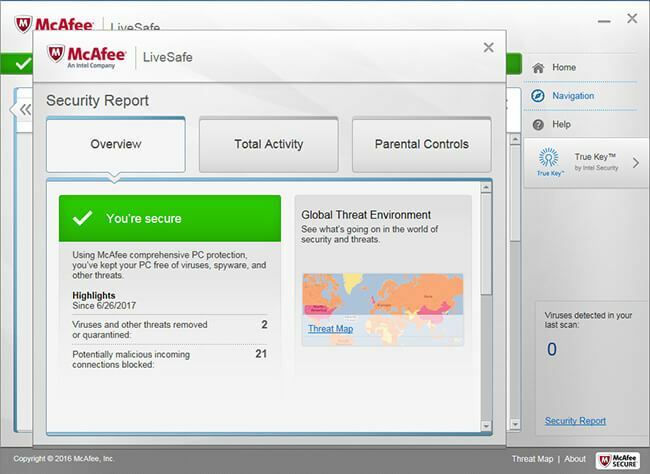 The McAfee Antivirus Plus and the LiveSafe 2019 performed very well when we tested them for this review. Malware files (Trojans, spyware, viruses) were quickly removed and moved to quarantine. Detection rate of infected files is excellent. We didn’t deal with infected files that the antivirus couldn’t detect. Another great thing about the antivirus suite: reduced number of false negative reports compared to other security solutions. The Antispam filter is another pleasant surprise from McAfee. This feature is only available for the LiveSafe security suite. We tested this filter to check its efficiency using various scenarios: unsolicited, infected and phishing emails. The antispam filter worked flawlessly every single time. 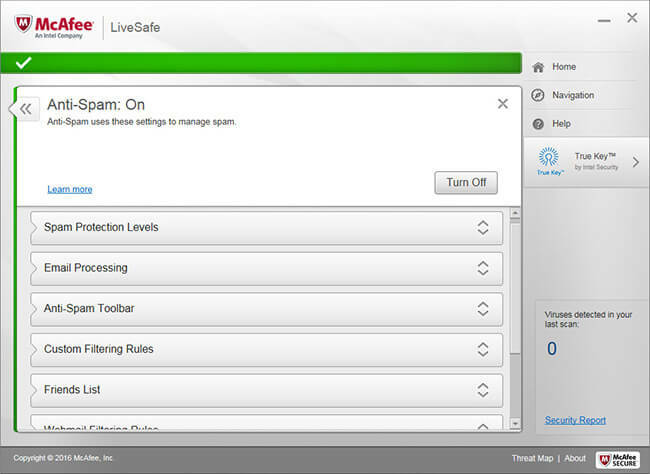 The antispam module comes with advanced settings and five different levels to filter spam: minimal, limited, balanced, aggressive and restricted. After automatically marking filtered emails, you can decide what happens to them. By default, McAfee will automatically move them to a folder called Spam. The antispam toolbar works very well both with modern Microsoft Outlook versions and Mozilla Thunderbird. It allows you to filter using certain keywords of your choosing. The feature also lets you block certain character types (like Arabic or Farsi, for example) or filter web emails. 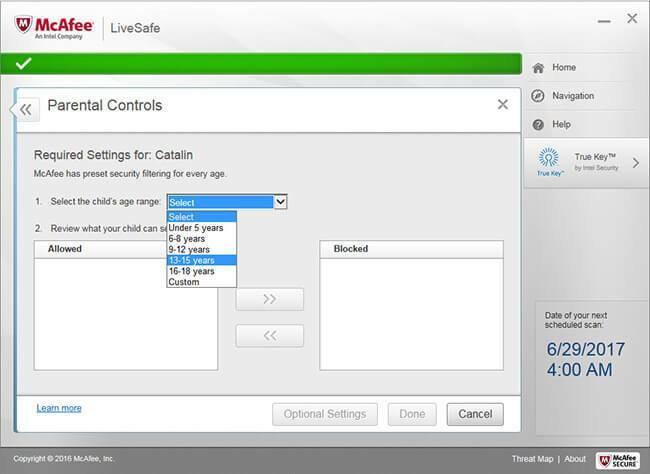 If you have kids or want limited access to certain websites for some members of your family, the Parental controls module integrated in the LiveSafe version is the way to go. The Antivirus Plus 2019 doesn’t have this feature. We tested the filter to see how efficient it was and how much it could protect against information and sites unsuited for a certain age group. Parental controls has several filtering and traffic blocking versions, depending on various predefined age groups: under 5 years, 6-8 years, 9-12 years, 13-15 years, 16-18 years and custom. After choosing an age group, you can have additional settings based on the type of information you want to block. Adult, gambling or drug-related sites not recommended to minors are blocked by default when Parental controls is activated. You can change the settings of a default filter or you can opt for Custom filtering whenever it’s possible to perform the action based on various parameters. After the settings are chosen, Parental controls will require a block password. This is needed so that only you can modify filters. Kids won’t be able to unblock or change them. The filtering traffic module for certain types of users also lets you activate or deactivate it during various hours. This is only possible when more than one person uses the same computer and one of them is an adult. The filter can be turned off when parents are home and they use the PC. Overall, after testing the module we can say that McAfee has an excellent and robust solution for users who want to protect their kids from accessing dangerous information for their age group. The spread of cyber attacks is also possible thanks to illegal access of the ports a computer uses to connect to a network. Hackers who create such threats aim to steal data from computers, use a PC’s resources for different activities or monitor activity illegally. The firewall is a necessary security solution if you want to stay protected against cyber attacks. 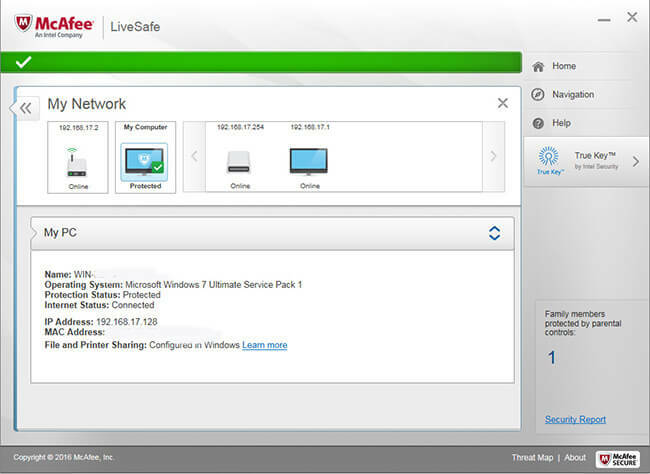 The Firewall feature offered by McAfee is solid and easy to use. Plus, it comes activated by default. Compared to other security products, the firewall included in the McAfee package allows customization and advanced settings like traffic control, personalized connections for different applications, activity history, network connectivity and the control of ports. We tested the firewall integrated in the McAfee Antivirus Plus 2019 and had very good results for every attack simulation we performed. This feature available in the most recent McAfee Antivirus Plus offers extended protection against cyber threats like phishing, websites infected with malware or dangerous viruses. As with other security software we tested, the Web protection module shows site rating directly in the browser. 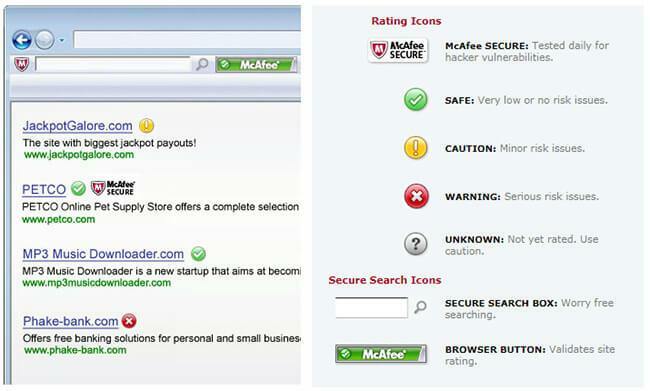 Also known as Siteadvisor or Webadvisor, the feature is McAfee’s way to help protect users against infected websites. There are four levels of rating for a website: safe (very low or no risk issues), caution (minor risk issues), warning (dangerous websites) and unknown. A certain color will be displayed next to the site whenever results of a search are shown in the browser. Depending on these, you’ll get to decide whether or not you want to visit a certain website. During our tests for today’s review, we tried to identify several dangerous sites with help from the Web protection feature. The results we got were good. The module was able to locate all the threats associated with the infected websites every single time. McAfee’s security suites feature a couple of interesting additional uses. Some of them are only available for the premium versions (like Internet Security, Total Protection and LiveSafe). Others are also available with the McAfee Plus Antivirus. Quick Clean improves your PC’s speed by removing useless files. We took McAfee’s solution of identifying vulnerabilities for a spin and we were pleasantly surprised. This one’s very similar to BitDefender’s Vulnerability scanner. Scanning your computer is done two ways: with or without checking updates missing from the Windows OS. If you choose to ignore the lack of updates, the module will scan your entire computer to find software applications without updates. At the end of the process, a report containing the identified problems will be displayed. Based on this, you can then decide whether or not an update for the vulnerable applications is useful. Before describing this feature, you should know that it’s only available for the Internet Security, Total Protection and LiveSafe suites. The Antivirus Plus doesn’t have it. We tested the module in real-time conditions after using a specially made email address to capture spam messages. The feature works very well. Its filtering and removal of unsolicited email messages is excellent. If you receive such emails, this antispam solution will offer the necessary protection against them. Looking for maximum protection when you remove a file from your PC and you don’t want to retrieve it ever again? The File shredder module available with the McAfee Antivirus Plus 2019 is an option you should consider. The feature works by using overwriting in locations where the file doesn’t exist anymore. There are many ways to destroy data. Depending on the level of security you need, you can opt between the following: Quick, Basic, Safe, Comprehensive and Complete. To test the feature, we destroyed several files using the File shredder. Then we tried to retrieve the data using various methods. Neither of them could bring the files back. All in all, we were very impressed with this module. Rivals usually don’t feature the File Shredder within their security packages. Using a wireless network means ever-growing risks due to the numerous ways of attacking devices that are connected to it. 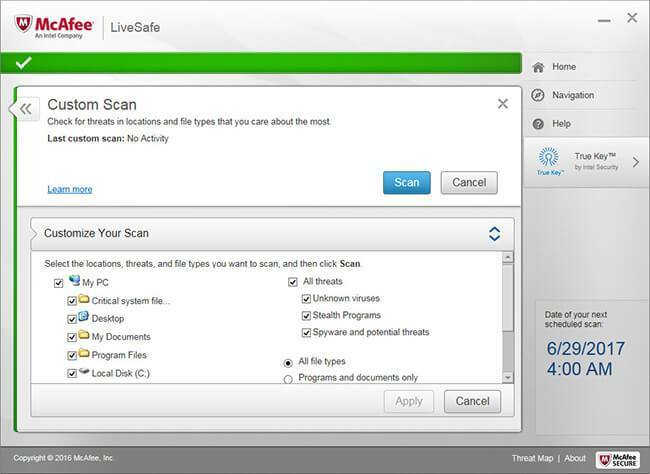 The McAfee Antivirus 2019 integrates a solution used to prevent such security dangers. Its name is My Home Network. The latter scans ports, WiFi networks and devices connected to the same network. When it’s done, you’ll see the status of network connectivity. If the connection isn’t safe, you’ll get details about the network and how to solve any upcoming problems. My Home Network is easy to use and highly efficient. We performed tests using several wireless networks and devices with different configurations connected to said networks. We got very good results in each case. 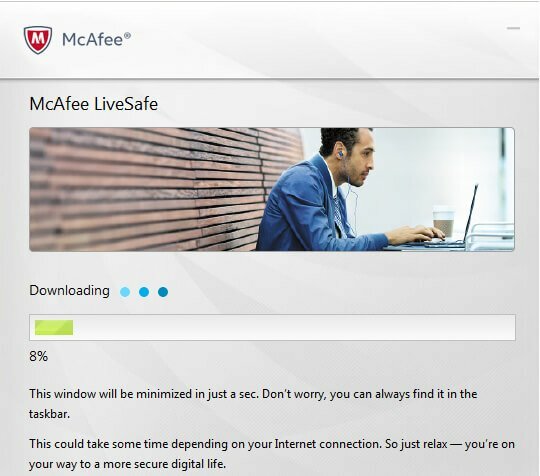 This is another feature that’s not included in many of the security products we tested, making the McAfee Antivirus 2019 the better option. In case you’re dealing with a slow computer, the problem is caused by the presence of outdated or useless files that clutter different parts of your device. 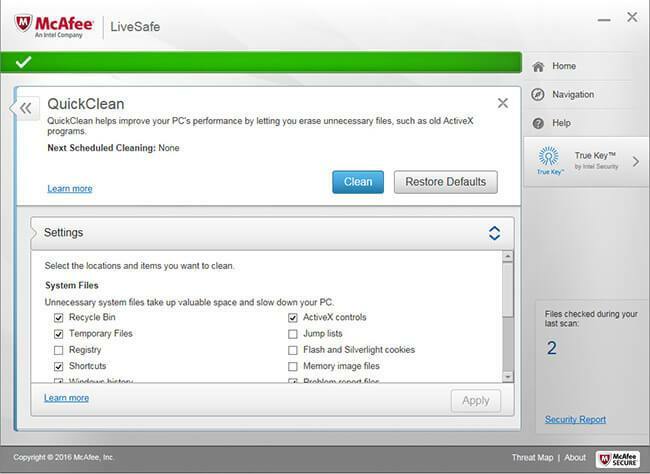 The Quick Clean feature delivered by the McAfee Antivirus Pro cleans the computer and improves its speed. You can select several options during the scanning and removal of these unwanted files. The module will take a quick look at temporary files, the recycle bin, registries, shortcuts and possible vulnerabilities like ActiveX controls or Flash cookies. We had satisfying results while testing the Quick Clean feature. The files that were identified as useless were removed. We noticed improvements in reaction time for some configurations after they were cleaned. Here are the other features available for the iOS version: Anti-theft, Remote locate, Data backup, Data wipe and Data restore. The Android version has a lot more interesting features: Battery Optimiser, CaptureCam, Remote lock, Privacy wall, Performance optimizer and Memory cleanup. 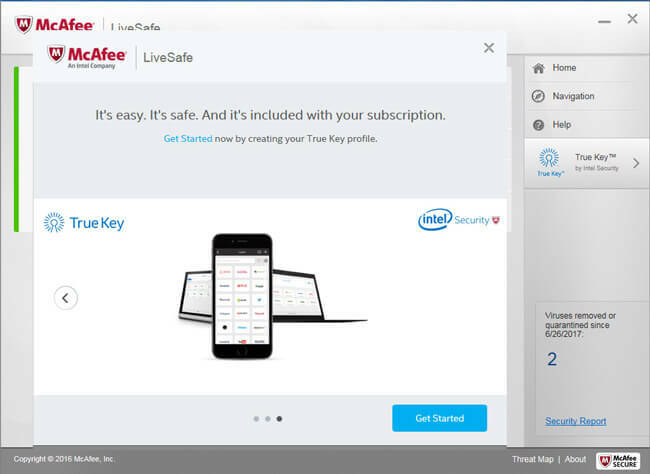 For both of these operating systems, McAfee lets you use the True Key technology of unblocking and accessing your device without the use of a password. Even if we didn’t include it in our Features category, the final activity report from McAfee has an interesting feature. It contains complete details regarding possible cyber attacks detected during the scanning. This report has three sections: Overview, Total activity and Parental controls. Each of them gives you details about what’s been identified in every one of those sections. We tested the way the McAfee Antivirus reacts by using several computers with different configurations. On the whole, there was no notable impact on our devices’ resources. However, very low hardware configurations did report certain issues concerning the way the antivirus managed a PC’s resources. If you own an outdated computer (with a processor of under 1GHz and 512MB of RAM), our advice is to choose another security solution. Like BitDefender, for example. 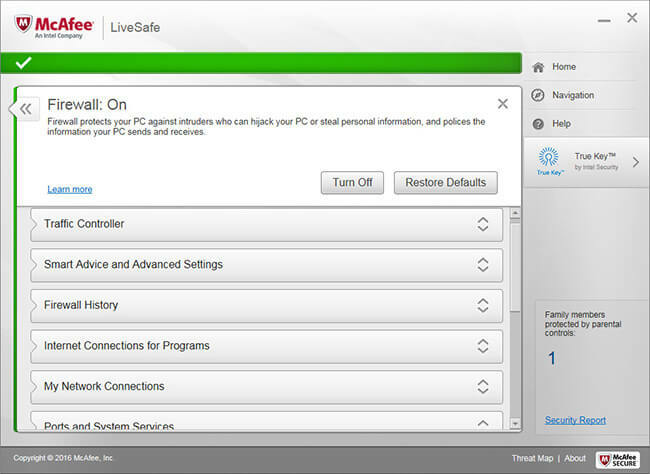 The security packages from McAfee range from the Antivirus version and end with the LiveSafe option. Prices range depending on the type of security you get. The McAfee Antivirus Plus is available starting from $24.99, a very good price considering what it can offer. For this price, you get features that aren’t available in the basic packages delivered by many of McAfee’s rivals. 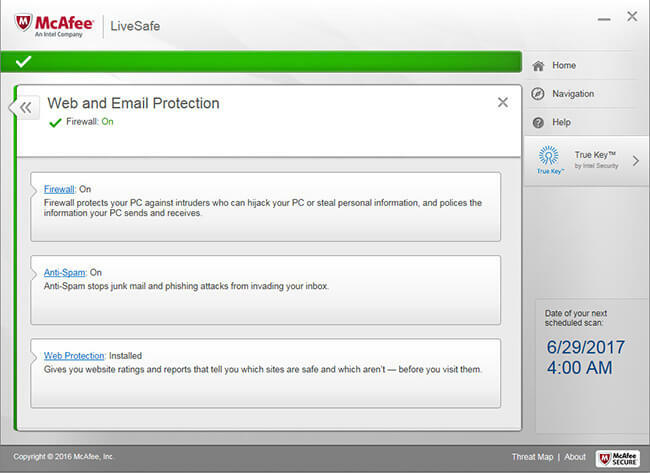 Here are the premium security packages: McAfee Total Protection, Internet Security and LiveSafe. Depending on your budget and what options you prefer, you can opt for one of these products. More details regarding prices and discounts are available here. A company as old as McAfee is one of the strongest in the world also because it receives lots of recognition for its products throughout the years. Every major independent lab that tests security solutions agree that the latest version from McAfee is an excellent product offering very good protection and a reduced level of false positive alerts. We’re glad to know that labs such as AV Comparatives and AV-Test reached the same conclusions as we did while reviewing the McAfee Antivirus Plus 2019. The premium security packages offered by McAfee are as follows: Total Protection, Internet Security and LiveSafe. The Total Protection version has additional features, such as Security Management Console, File Lock (some files can be locked with passwords) and Virus Protection Pledge (remote support by a McAfee representative whenever you have a problem). 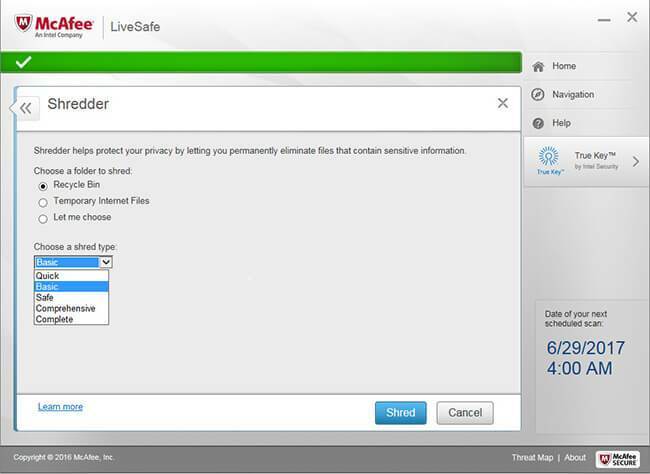 The LiveSafe security solutions feature the same options and a new one: cloud file protection. Its name is Secure Cloud Storage. Remember: when you choose one of their security suites, McAfee offers free protection for mobile devices running Android and iOS. We’ve now reached the end of our analysis of the McAfee Antivirus Plus 2019. After performing numerous tests, we can conclude that this security solution is an excellent companion for those of you who want to stay protected against unwanted cyber threats. McAfee Antivirus Plus 2019 ofers maximum protection against hackers and malware. Robert is passionate about all things related to cyber security and he spends a lot of time testing security solutions to find the most efficient ones. Strong knowledge of the criminal cyber-underworld and how to avoid its implications on home and company devices. As a bank system administrator, Robert is responsible for evaluating the most important information security standards. He works with various systems strongly connected to cyber-security: SCCM, SCOM, WSUS, virtualization systems (Cluster Hyper V, VMWare, Direct Access, DNS) etc.